GILDAN ULTRA OR FRUIT OF THE LOOM HD brands used for tees, 6 oz., 100% pre-shrunk cotton, sport gray 90/10. These are the highest quality tees that each brand makes...click here to check GILDAN and click here to check Fruit of the Loom blank t shirt reviews. FREE SHIPPING when you order 3 tee's of ANY design, size or color...U.S. only. 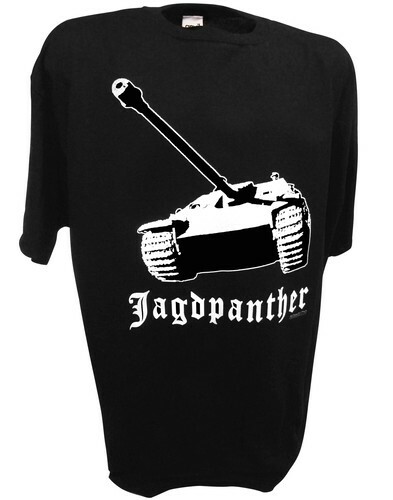 On July 30th of 1944 near Les Loges in Normandy, three Jagdpanthers from schwere Panzer Jaeger Abteilung 654 ambushed a squadron of British 6th Guards Tank Brigade killing some 10-11 Churchill tanks in a short interval of two minutes. At the same time, other squadron of British 6th Guards Tank Brigade opened fire at three Jagdpanthers causing crews of two of them to abandon their vehicles (as a result of damaged tracks), while the third one retreated.